No time like the present to get on a roll. The Cubs once again take the field against the hapless (HAPP, amirite?) Marlins in Miami tonight at 6:10 PM CST. Every team wants to get off to a good start and the Cubs are no different, they have a great opportunity to really put the screws to the Marlins tonight and take a big step towards a series win with a big effort. Kyle Hendricks takes the ball in what many believe could be a special year for the professor, as you can see from the image above, Kyle is jacked up. The Cubs will face off against Caleb Smith who is someone that I have never faced so I have something in common with all the Cubs. No Cubs hitter has any experience against Smith who has just two games started at the big league level. Neither were very good, but he did have a strong year in the minors last year. Player to watch: It’s Hendricks, expectations have never been higher and I’m right there with the masses. Time to take it to another level. His counterpart Zack Greinke didn’t fare so well as the Cubs jumped on him early, scoring three times in the first, and never looking back. Anthony Rizzo, and Kris Bryant each had an RBI in the first, a single for Rizzo and a double for Bryant. Miguel Montero pushed the Cubs lead to three with a sacrifice fly, and Zobrist smacked an RBI double in the fourth to close out the scoring. Great chance for the Cubs to move to 5-1 on the season, and this road trip tomorrow as Jake Arrieta gets the ball. It wasn’t the desired result for the Cubs but there were plenty of things to like in the Cubs spring training opener today against the Brewers. 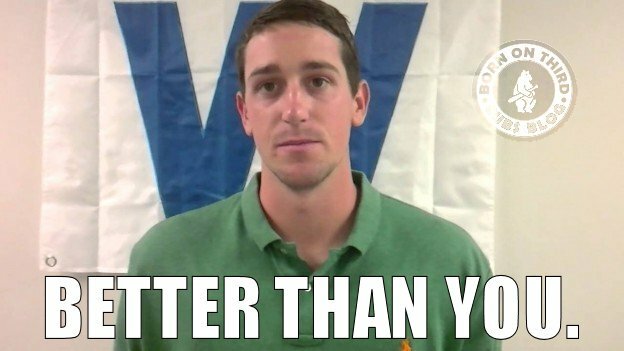 Travis Wood, Kyle Hendricks, Clayton Richard, Rex Brothers, C.J. Riefenhauser, and Spencer Patton combined to four hit the Brewers while walking one, and striking out thirteen. The bats were slow to get going in this one as the Cubs group of hitters could only push across one run on seven hits. Javier Baez got the start in center today, and struggled in the early going. He played an out (maybe a double) into a triple right off the bat, then one hitter later he dropped a fly ball, it’ll get better. Despite losing Adam Wainwright for the season, the Cardinals are off to their best start in basically forever. They are 18-6 on the season, and sit at the top of the NL Central with a 4.5 game lead on the second place Cubs. The Cardinals have won six straight games, and are 11-2 at home, which means they are bound to lose some games! The Cubs come into this series limping on the offensive side of things, not a whole lot is going right at the plate. Despite recent struggles, the Cubs are off to a pretty solid start of their own, and this series is probably the first “big” one of the year as the Cubs would love to split, and hold steady in second place. Cardinals: Of course Matt Carpenter is taking it to another level this year, he’s been fantastic. Over his last seven games he’s hitting .360 (9-for-25) with four doubles, a triple, a dinger, five RBI’s, and five walks. Go away. Cubs: After a slow start to the year, Miguel Montero is turning it on. Miggy is hitting .467 (7-for-15) over his last four starts with an RBI, and a walk. Would like to see some extra base hits, but he’s squaring it up. Cardinals: Well, it’s only a matter of time before Yadier Molina starts coming up with big hits, it’s usually against the Cubs. Hopefully that doesn’t happen, the aging backstop is struggling, he’s hitting .111 (3-for-27) in his last seven with only two strikeouts, the BABIP (batting average on balls in play) is getting him. Cubs: It was probably a matter of time before Kris Bryant cooled down, he wasn’t going to hit .400 this year contrary to many reports from fans. Bryant is hitting .190 (4-for-21) over his last six with four walks, and ten strikeouts. Weather: Mostly cloudy, 47 degrees. 20% chance of rain, a passing shower. Both the Cubs and Pirates head into a three game series on the Northside with some momentum. The Cubs are coming off an exciting, rain shortened series in Cincinnati where they took both games, one of which was another come back victory. After taking the last two games of the series against the Cubs, the Pirates swept the Diamondbacks this weekend and have won their last five games. It’s a battle for second place as the Cubs (10-7) and the Pirates (11–8) are both two games back of the Cardinals in the Central. Pirates: Noted Cub killer Neil Walker is apparently not just killing the Cubs lately, he’s scorching hot. Over his last seven games, the Pirates second baseman is hitting .393 (11-for-28) with five doubles, and five RBI’s. Cubs: There are a lot of good first basemen in the National League, Anthony Rizzo might be the best. Over his last seven games, Rizzo is hitting .455 (10-for-22) with two doubles, a dinger, two RBI’s, four walks, and one strikeout. Pirates: I’m not sure I want to mention this, because you know it won’t last. Andrew McCutchen is hitting .143 (3-for-21) over his last seven games with one double, and seven strikeouts. Cubs: It’s probably not easy to be a 21 year old in the Majors, Addison Russell is proving that. In his first five games he’s hitting .136 (3-for-22) with two doubles, four RBI’s, and twelve strikeouts. After having eight of their first eleven games at home the time has come for the Cubs to hit the road, and face some stiff NL Central competition. Tonight’s game in Pittsburgh starts a seven game road trip that will see the Cubs battle the Pirates for four, then head to Cincinnati for three. The Pirates are playing solid baseball right now as they have won three straight games, and sit a half game behind the Cubs for second place in the Central. The Cubs are coming off a tough series loss to the Padres, their first of the season. 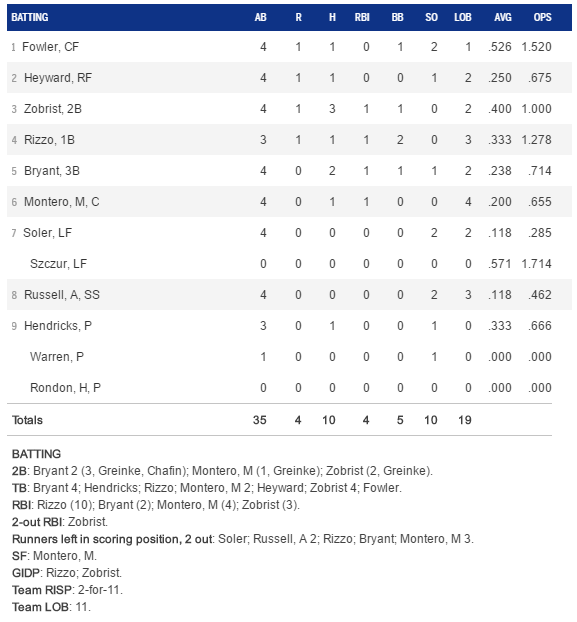 All three games could have went the Cubs way, but a burnt out bullpen, short starts, and lack of clutch hitting came back to bite them. Pirates: After a slow start, and a big new contract, Josh Harrison is starting to heat up at the plate. He is hitting .292 (7-for-24) over his last seven with a double, homer, and two RBI’s. Cubs: Anthony Rizzo was getting on base earlier in the year but wasn’t seeing too many hits dropping, that is changing. Rizzo is hitting .318 (7-for-22) over his last six games with a home run, three RBI’s, a double, and SIX walks. Pirates: After a productive 2014, Jordy Mercer has come out of the gate struggling. Mercer is hitting just .118 (2-for-17) over his last seven games with only one walk, two strikeouts, and no runs scored. Cubs: Second base is an issue for the Cubs right now, as both Jonathan Herrera, and Arismendy Alcantara are scuffling. Herrera is hitting just .158 (3-for-19) over his last six games, while Alcantara comes in at a .143 (2-for-14) clip, with six strikeouts.